Comment: Henry Rodolph Walter Lemann (1811 - 1899) arrived in Port Fairy, on 24 January 1847 and settled at Woodlands, Victoria. Lemann apparently then returned to the UK before returning to Australia with his new wife, Mary. On 16 February 1850, the Adelaide Advertiser reported the arrival 4 days earlier of Mr and Mrs Lemann on the Statesman. In 1853 the squatters lease for Woodlands had been challenged and taken over by William Pomeroy Greene. Lemann applied for a Squatters lease there in 1848, however the lease was challenged again the next year (NSW Gazette 8 June 1849). It appears that attempts by Lemann to settle at Woodlands were not successful and the couple returned to the UK within a few years. Woodlands Homestead flourished. An 1869 painting of the Woodlands homestead by Eugene von Guerard is in the National Gallery of Australia. Today it is registered as an historic house. The wedding dress worn by Mary Earles in the 1851 portrait is very similar to a wedding dress dated 1851 which is in the collection of the Victoria and Albert Museum (T.367&A-1988): Some mystery surrounds the painting of the portrait. It must have been painted by Earles in 1851 in the UK but this would have been after Mary had left for Australia in late 1849. It could have been painted from sketches of Mary. She appears in a painting by Chester Earles, entitled A Letter from Australia; A Family Group, shows the Earles family gathered at afternoon tea listening to Charles Earles reading a letter from their sister Penelope who had migrated to Australia with her husband, George Selby, in 1840. This painting was exhibited at the Royal Academy in 1849 and at Suffolk Street in 1850. (It is currently in the Fox Talbot Museum, Wiltshire, UK). The artist depicts himself standing behind Charles, the letter reader. Mary Earles is seated lower left (she is no. 4 - a key to the identities of each family member is also illustrated below): It is possible that the artist sent the portrait of Mary to her in Australia – hence the fact that it is in a travelling case. It would then have returned with her to the UK, sometime in the mid 1850s. From Dictionary of Australian Art & Design online, entry by Candice Bruce, 1992, updated 2011: Chester Earles, portrait and narrative painter, was born on 18 August 1821 at precisely 6.30 a.m. according to the family bible. He was the third son, one of fifteen children of William Earles, who worked in a London bank, and Elizabeth née Chester, of Hackney, London. After some initial training as a miniature portrait painter – at the London National Gallery, according to the family – Earles entered the Royal Academy Schools in 1842 then studied at Paris in 1846. He exhibited with the Royal Academy from 1844 to 1863 (56 works) and with the Society of British Artists (Suffolk Street) between 1842 and 1863 (55 watercolours and oils). Altogether Graves lists 130 works shown by him in the major London exhibition centres during this period, though some were repeats. Most were portraits, but several were narrative and religious paintings. One, exhibited at the Royal Academy in 1849 and at Suffolk Street in 1850, entitled A Letter from Australia; A Family Group , shows the Earles family gathered at afternoon tea listening to Charles Earles reading a letter from their sister Penelope who had migrated to Australia with her husband, George Selby, in 1840; Chester himself is standing behind Charles. Chester’s letters to Penelope (La Trobe Collection) discuss his early struggles to make a living as an artist in London. 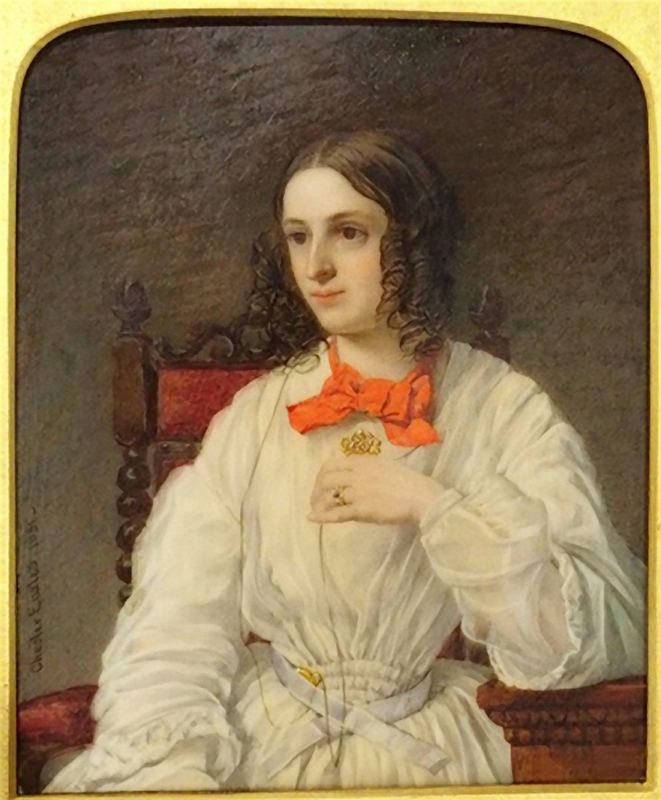 Although Penelope died in 1851, another married sister, Mary Lemann, came out to Victoria that year [sic, it was February 1850], and in 1857 the widower George Selby married his younger sister, Susanne. In June 1858, a Melbourne periodical noted that Mr Selby was 'endeavouring to dispose of a series of six clever pictures by Earle [sic] R.A. [sic]’ by means of an art union, the paintings being on view at Joseph Wilkie’s music shop. Earles had exhibited portraits of Mrs James Selby, G. W. Selby and Miss Selby at the Royal Academy, and the family connection was doubtless instrumental in bringing him to Victoria early in 1864, although his failure to sell portraits due to the increasing popularity of photography was the major impetus. In 1866 Earles exhibited At the Foot of the Cross and An Awkward Pause (shown Suffolk Street 1859) at the Melbourne Intercolonial Exhibition. The jury noted that the former was “one of the few figure pictures in the Exhibition” and considered it remarkable “for its feeling and careful execution”, while a subsequent reviewer considered it “bold, careful and correct…despite some coldness of colouring”. In 1869 Earles contributed fifteen paintings to the Melbourne Public Library Exhibition. Most were biblical subjects or portraits; and Mary Magdalen at the Cross, at least, had previously been shown at the Royal Academy. Adam and Eve, described in the catalogue as on ivory, must have been a miniature. Six were shown again later that year at the Ballarat Mechanics Institute Exhibition. On 6 August 1866, Earles married a widow, Caroline Elder, at Christ Church, South Yarra, Melbourne. With the three children from her first marriage – Augusta, Ellen and Charles Elder – the Earles moved into Rokeby Cottage in Murphy Street, South Yarra, where they remained until 1878. Earles worked as an inspector at the Bankers’ Clearing House and continued to paint in his spare time. Interior with Figures (1872, Queensland Art Gallery) includes a self-portrait, possibly with Caroline and a step-daughter, or perhaps his two step-daughters. When the Victorian Academy of Arts was formed in 1870 with O.R. Campbell as president and James Robertson as secretary, Earles was elected treasurer. Three years later he succeeded Campbell as president, a position he held until the Academy merged with the Australian Artists’ Association in 1888. At the Academy’s first exhibition he showed paintings inspired by Milton ( L’Allegro and Il Penseroso) and Fletcher, as well as a handful of portraits. The Argus thought the twin Milton subjects 'unusually happy’ for Earles: The former is not the Euphrosyne of Westall or Stothard but a blond young beauty of the nineteenth century, more “fair” than “free”, with hair which does not owe its tint to any auricomous compound, and a face very pleasant to look upon. He appears to have taken a small studio in Flinders Street at about this time. His painting Feather Pickers, A Pause in the Work 1876, ( National Gallery of Australia) exhibited with the VAA in 1876 as 'Stripping Feathers’,previously in 'The Fairfax Corporate Collection of Australian Paintings’, . In 1878 Earles moved his private residence to Homegarth in Motherwell Street, South Yarra, where he remained until his death. Earles continued to exhibit with the VAA until 1884 and contributed to various Intercolonial and international exhibitions held throughout the 1870s and 1880s.Bianca and Katharina , shown at the Victorian Intercolonial Exhibition, were sent on to the 1873 London International Exhibition. Other paintings were sent to the New South Wales Academy of Art in 1872, 1873, 1875 and 1876. He won medals at the first two for L’Allegro ('Cheerfulness personified as a young intellectual-looking girl of “sweet sixteen”’) and Bianca and Katharina (again). He won a certificate of merit in 1875 for Ophelia, an oil also shown in Melbourne before being sent to the 1876 Philadelphia Centennial Exhibition together with portraits of two other Shakespearian women, possibly Bianca and Katharina once more. The Sydney Mail critic thought Ophelia 'very pretty, very unnatural and strangely colourless’, while The Latest News from England was judged 'commonplace’. Depicting two girls looking over the latest fashions in the Home News ('the faces of both are stony’), it was expressly designed to be photographed by Johnstone, O’Shannessy & Co. as one of a series for subscribers to the Art Union of Victoria but was deemed to be 'scarcely worthy of the rest of the series’. Earles’s output declined in the 1880s. Since he continued to work at the Bankers’ Clearing House until at least 1881 (his address in the annual report of the Art Union of Victoria that year), pressure of work was possibly a contributing factor. Other possibilities are ill-health (he was now in his mid-sixties) or a realisation that his style was outmoded. In 1882 he exhibited designs for a reredos 'in course of erection’ at Christ Church, South Yarra, and he showed a stained-glass window design for St Martin’s, Hawksburn, in 1883. A self-portrait shown at the 1888 Melbourne Centennial International Exhibition (unlocated) and a painting simply titled Portrait shown with the Victorian Artists’ Society in 1892 (both of which may have been painted years earlier) are the only exhibition works known after 1884. Throughout his career Earles’s subject matter was either portraiture or subject paintings inspired by Keats, Milton, Spenser, Tennyson, Shakespeare and the Bible. The latter were little more than elevated portraits with little narrative content, Earles being one of the few painters working in Australia at the time who painted figure subjects almost exclusively. He showed little interest in Australian themes, exhibiting only two works, Young Australia (in 1876) and Third Day of a Hot Wind – No Change Yet (in 1877, 1879 and 1880), with Australian-sounding titles. Both would have been figure subjects. The latter (known only from a rather coarse black and white engraving in the Australasian Sketcher and a drawing after the painting in the Illustrated Australian News of 25 January 1882, 8, entitled 'A hot wind day’) depicts a little girl drooped on the lap of 'a youthful matron in a state of languor and limpness, on the evening of a third hot wind day which has committed such terrible ravages upon her complexion as almost to defy the power of cosmetics to remedy them’. His most Australian subject, The Stockrider (unlocated), was issued as a photograph by the Art Union of Victoria in 1873.